"You can post your public buzz simply by speaking it. From the Google Mobile App for iPhone or Quick Search Box on Android, select the voice search icon, say "post buzz" followed by the text you'd like to post, and watch your words appear. Before your post is sent, you'll be able to edit it or change its tagged location." It's probably the first time when Google's voice search feature can be used for other things than searching. In fact, you don't even have to use the voice search feature: go to google.com on your mobile phone's browser, type post buzz, followed by your message and Google Buzz will open. Maybe Google will add similar shortcuts for creating Google Calendar events, composing Gmail messages or finding Google Docs files. Yahoo's open shortcuts are an interesting approach to adding command-line features to the search box, but they're less powerful than YubNub's commands. It just doesn't work on the iPhone. Maybe they are still rolling out some changes to make this possible, but for now it just searches for "post buzz whateveryousay". @wesley false. It just worked on my iphone, update your google app. It's a feature of Google's mobile site, so the mobile app is required only if you want to use the voice search. 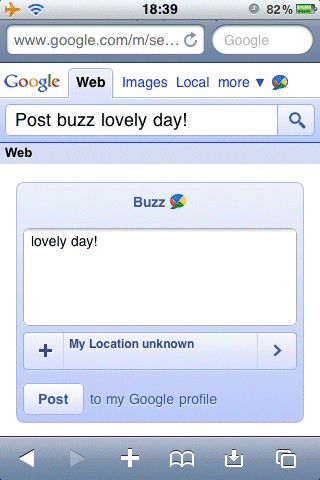 Most likely, "post buzz" sends you to Google Buzz only if you use the US English interface. It's a feature of Google's mobile site, so the mobile app is required only if you want to use voice search. Most likely, "post buzz" sends you to Google Buzz only if you use the US English interface. I use the "English" interface language, but my region is set to UK. It does not work for me. I guess the "region" plays a roll there. This Voice search would be great for UK, but like Google voice, Google voice search is not available. Voice search is available for iPhone, Android, Blackberry and it's limited to English (US, UK, Australia, India), Mandarin and Japanese. I also hacked a previous version of Google mobile to do this, so I know that it is possible. Also, the screenshot of MobileSafari above includes a downloads icon on the toolbar--what is that? It's Safari Download Manager (SDM), a great MobileSafari plug-in for jailbroken iPhones. And if you have an iPhone, don't forget that you can share pics with BuzzR. Unfortunatly, as long as Google doesn't want to open its api, buzz will be limited.